In some cases, the renewal options are agreeyd to during final negotiations for following the execution of the original lease, and this form is appropriate for such situations. 1. 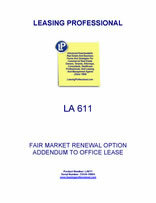 Tenant may, at its option, renew the term of this Lease for one (1) additional term of __________ (00) months, provided that this Lease must be in full force and effect under the original term or any valid renewal thereof, and Tenant shall not be in default in any of its obligations under this Lease at the time of exercise of such option or at the time the renewal term would begin. Such renewal shall be upon the same terms and conditions as provided elsewhere in this Lease, except that (i) the original term of this Lease may not be renewed more often than the one time set forth above, (ii) Landlord shall have no obligation to install improvements in the Premises nor to provide Tenant with any allowance, and (iii) the annual Base Rental for such renewal period, i.e., to be payable in equal monthly installments in the same manner as during the primary Lease Term, shall be the Prevailing Building Rental Rate (described below). Such option shall be exercised by Tenant's giving notice to Landlord by certified mail, return receipt requested, at least _____ (0) months prior to the end of the then-existing term; and, if not so exercised, such option shall automatically expire and terminate (i.e., time being of the essence).